Unless you’re lucky enough to be born with a spendthrift trust fund, you will have to make your money the good, old fashioned way — work for it. But, understanding how money is made can give you an advantage. There are four basic ways to earn money, and these strategies could help you build a fortune. This is the source of income that the middle and lower classes consider the most important. It is the money you receive for selling your time to an employer. It is often represented as salary or wages. You’ll often hear well-intentioned parents telling their children to find a “good job”, preferably one “with benefits”. The rate you receive for your time depends on how rare and in-demand your skills are to society. A gifted brain surgeon, for instance, can charge millions of dollars per year because there simply aren’t a lot of men or women who can do the job. Someone who pushes carts at a discount retailer earns less not because they are any less intrinsically valuable as a person, but because virtually anyone in good health can push a cart, causing a huge supply of potential workers to drive down wages. To earn more money, you have to invest in yourself and improve the rate you can charge, work more hours, or a combination of the two. This type of income is the most tyrannical form of earning a living because you only generate money when you are actively laboring. A brilliant lawyer may earn millions of dollars a year, but he can’t continue to live off legal fees if he isn’t working. That may be fine if you love your job, but for most people, there are other things they’d rather be doing. This type of income comes from money borrowers pay you to “rent” your capital (the term capital refers to money you’ve set aside for investment purposes; you’ll hear it used a lot on Wall Street). When you buy a certificate of deposit at a bank, for instance, you are lending money to the bank in exchange for a predetermined rate of return, typically a few percentage points per year. The bank takes the money it "rents" from you and lends it out at a higher rate, pocketing the difference. (For those of you who are curious, this is why the yield curve is so important. Here's an example of interest income: A grandmother lends money to people who want to buy a house but who have bad credit and are unable to get a mortgage through traditional channels. They buy a property and she loans them the money to fund the purchase, charging 13 percent interest. For a typical $150,000 loan, she will receive $19,500 per year in interest income or $1,625 per month. In essence, her money is going out and working for her. This represents your share of the profits of a company in which you have bought an investment. If you own 50 percent of a lemonade stand and the company had sales of $1,000 with costs of $500, and $500 in remaining profit, your share of those profits would be $250 (because your ownership of 50 percent of the shares is entitled to receive 50 percent of the profit). That money is paid out to you as your “cut” of the earnings. A good investment is one in which the company earns more year after year, increasing the amount of cash that is sent to you on a regular basis. Just like interest income, the essence of dividend income is that your money is going out and working for you. There are some forms of labor, however, that can be included in this category. A salesman who earns commissions on recurring orders with little or no work is, in effect, running a business. So, too, is the man who registers a new patent and earns royalties on it or a songwriter who earns money when a recording star choosing his or her song for a new single. They are generating profits from the recurring “sale” of their idea or property, making it no different than Wal-Mart or Target selling laundry detergent. An example of dividend income: My grandmother also owns some rental properties. She buys real estate and then charges the tenants money to live in her houses. In these cases, her rental business is generating profit equal to the total rent she receives less any costs, such as maintenance and upgrades on the properties. At the end of the year when she takes the money out of the business, those profits represent dividend income. This type of income is generated when you buy an investment or asset for one price and sell it for another, higher price, making a profit. Going back to our example of a lemonade stand, if you bought your 50 percent stake in the business for $2,000 and sold it for $5,000, the $3,000 difference would represent your capital gain. It doesn’t matter if you are talking about houses, rare paintings, diamonds, fountain pens, businesses, furniture, Canadian Gold Maple Leaf coins, stocks, bonds, mutual funds, or unopened mint condition Barbie dolls, if you buy it at one price and sell it at another, the profit that results is known as a capital gain (if you lost money on the transaction, it’s known as a capital loss). In recent years, many Americans found their standard of living artificially inflated during the housing boom because the capital gains that resulted from their homes appreciating in value was a source of income that they thought would continue indefinitely. Going back to our enterprising grandmother: If she were to sell one of the rental houses she bought for $80,000 to a buyer who was willing to pay $120,000, then the $40,000 difference represents her capital gain. As your portfolio (a word used to describe all of the assets you own) grows, you will find yourself earning all four types of investment income. There is an income generating method called the Berkshire Hathaway Model, which can be utilized in your own life. 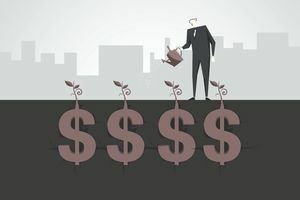 It demonstrates the secret to true financial independence by working diligently to build a collection of “cash generators” that bring in huge amounts of the latter three types of investment income — interest, dividend, and capital gains. Money made selling your time (salary and wages) is often taxed at far higher rates than the other types of income. The reality is, if you can make $5,000 in dividend income, you are likely to pay only $750 in taxes, whereas if you were a self-employed plumber and went out and earned $5,000 through hard work, after payroll taxes, Federal taxes, State taxes, and other charges, you would likely end up paying more than $2,000. There are only 24 hours in a day. Thus, you can only work so many hours. At some point, it becomes physically impossible to sell more of your time because, well, you ran out of time! You can always increase the rate you earn by developing rare skills that are in high demand, as we already discussed. With interest, dividend, and capital gains, there are virtually no limits to how much you can earn. If each year, you pile your money back into growing these sources, you can find yourself earning millions of dollars each year a few decades from now. Armor your investment portfolio with steady and predictable returns. How is Time Segmentation Used to Invest Retirement Money? What is a Robo Advisor and How Do They Work?